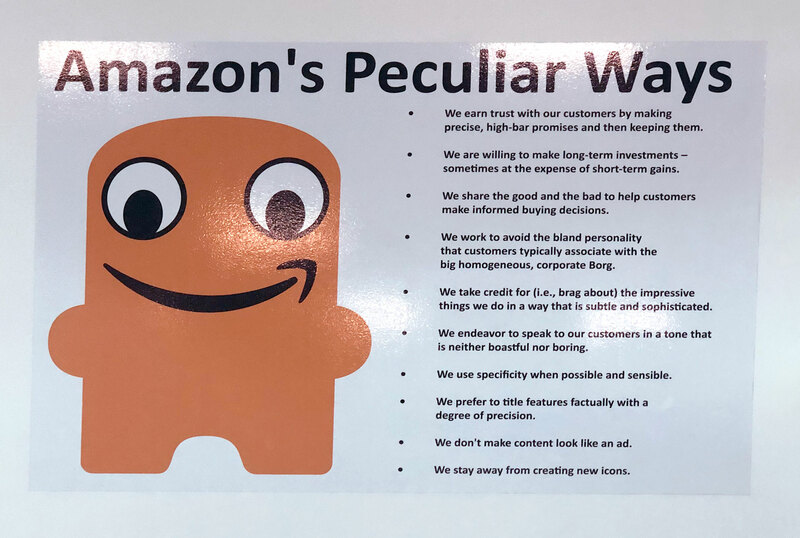 Amazon employees are not shy about expressing their enthusiasm for Peccy and what he stands for. [Photo: @callmejune]Galetti: In China, they make tiny little Peccy figurines. Everybody loves Peccy. Peccy has been depicted in many forms, including as a decoupage Christmas tree ornament. [Photo: Harry McCracken]Asked for details about the character, Amazon says that there’s no particular story behind him. He’s just a mascot, a symbol, as Galetti told me, of the company’s belief in the power of being peculiar. Though there’s obviously more to Peccy’s history than that—somebody created him, at a specific point in time—I choose to embrace his mystique even as I attempt to understand what he means to Amazon. Discovering that he exists at all feels like being let in on a secret. Peccy must have all of these committed to memory, right? (View full size here). [Photo: Harry McCracken]But if Peccy ever devoted himself exclusively to promoting the Peculiar Ways, those days are long over: “He was everywhere,” says one ex-Amazonian, who found Peccy’s use in corporate communiqués a touch patronizing. A flyer distributed to prospective employees for a facility in Kenosha, Wisconsin, featured Peccy in a doctor’s coat (in a section about medical benefits) and fantasizing about money (in one about bonuses and Amazon’s Career Choice program, which covers training costs for high-demand occupations). Once hired, those recruits might have found him in their onboarding materials. From there, they could have acquired Peccy gear such as hats, T-shirts, socks, and water bottles. This would be one of your more enormous Peccys. [Photo: courtesy of Balloon Designers]He also seems to transcend cultural boundaries with ease. As I pinged people who had posted Peccy imagery, I found myself talking to folks such as a woman in the Philippines who had helped her sister create Peccys wearing local outfits such as a Maria Clara gown for an Amazon employee contest. In Mexico City, artist Miguel Ángel Castillo Martínez has created ornate Huichol figures of Peccy, a process requiring a profusion of colorful beads, some epoxy, and about a month of labor. He says that the project began with a request from Amazon to “make something cool” and has one of the resulting Peccys up for sale with a price of $10,400. They’re not orange—but are still instantly identifiable as Peccy. [Photo: courtesy of Miguel Ángel Castillo Martínez]If Peccy had a more clearly defined personality—avuncular like Rich Uncle Pennybags, say, or boisterous like Kool-Aid Man—he might not appeal to so many Amazon staffers in so many places. Which, after all, is his whole reason for being.